eCite - Could introducing simulation into mandatory STCW short course programs be an innovative approach to assessing competence? Could introducing simulation into mandatory STCW short course programs be an innovative approach to assessing competence? This paper presents an argument that while the International Maritime Organisation, (IMO) has identified a number of critical factors, including human failures, which continue to cause disruption to worldwide shipping operations. The paper further accepts that there is supporting evidence that IMO amendments to conventions such as Safety of Life at Sea, (SOLAS) in 2002 have gone some way to improving ship-board conditions and operations, and the 2010 amendments to the mandatory training components of the Standards of Training and Certification for Watchkeepers Convention, (STCW) are likely continue this record of improved performance. The paper also identifies and argues that there is a risk for maritime training and education institutions, (MTE) that unless they are prepared to apply a higher level of assessment when determining an advanced seafarer’s level of competence to deal with significant on-board emergencies, this emerging trend of declining emergency response incidents may well be reversed. Supporting this argument is a 2013 review, produced in collaboration between Allianz and Cardiff University acknowledging that while there is evidence of reduction in occurrence of fire emergency on-board, the subject still remains a high risk factor when compared to the likelihood of other disruptive events occurring. 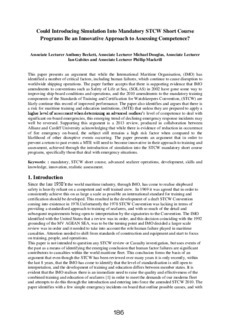 The paper presents an argument that in order to prevent a return to past events a MTE will need to become innovative in their approach to training and assessment, achieved through the introduction of simulation into the STCW mandatory short course programs, specifically those that deal with emergency situations. mandatory, STCW short course, advanced seafarer operations, development, skills and knowledge, innovation, realistic assessment.